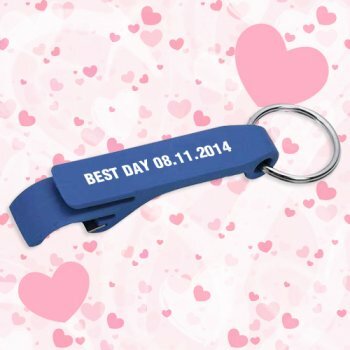 Personalized wedding keychains with mini bottle and can opener– royal blue are perfect for acknowledging your guests during wedding festivities. This mini bottle/can opener comes with a strong swivel keyring and integrated can/bottle opener. Offered in several attractive colors, you are sure to find the one, which may match with your décor, theme, location and more. You can get it impressively imprinted with your initials or wedding date and leave it on their tables. Or you can inset it within the tote bag. Request a quote to know wholesale savings for these custom wedding favors mini bottle and can opener with keychain rings – royal blue. Features – Royal blue plastic body and a tough metal split key ring.